We planned our Seine cruise, in accordance with the guidance, to start at LW Le Havre + 2 hours, in order to carry the flood tide for the whole passage, and for once this coincided with a convenient 0930 bridge and lock out of Honfleur. In company with Jomima, we had the lock to ourselves, having waved goodbye to a sailing yacht making the same passage an hour earlier. The 63 mile passage has to be done in one leg as the regular barge traffic makes it unsuitable to stop on the river overnight. We had forgotten just how much wash these vessels can make, and together with a fast motor boat claiming by his red and white flag to 'have a pilot on board', there were several occasions when the boat was left rocking and unstowed items crashed around the cabin. 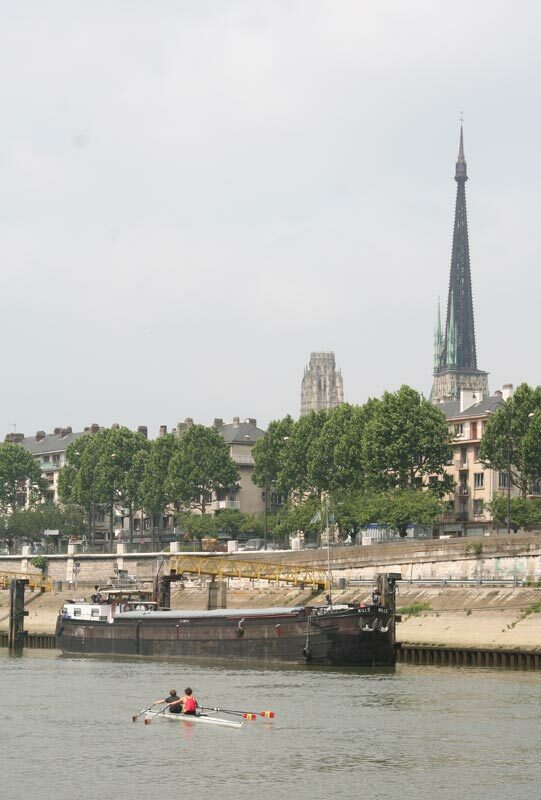 The fuel advertised in the Navicarte at the Halte Nautique is no longer available, so we made a detour around the Ile Lacroix at Rouen to the Sargasse fuel barge just upstream. We were rather offput by their unreasonable rates and unwillingness to negotiate so bought only a modest 300 litres. However, on departing we found that the starboard engine would not start, so had to complete the short journey back to the moorings on one engine, with the engine alarm as company for good measure. The carpets were soon up in order to investigate the problem and after a cooling off period the engine obligingly started without demur. We opted for a lay day in Rouen in order to have time to recruit the services of the local chantier plaisance, although as the problem had by then disappeared as mysteriously as it arrived, in the morning we didn't have the heart to explain a non-existant problem to an engineer in french. 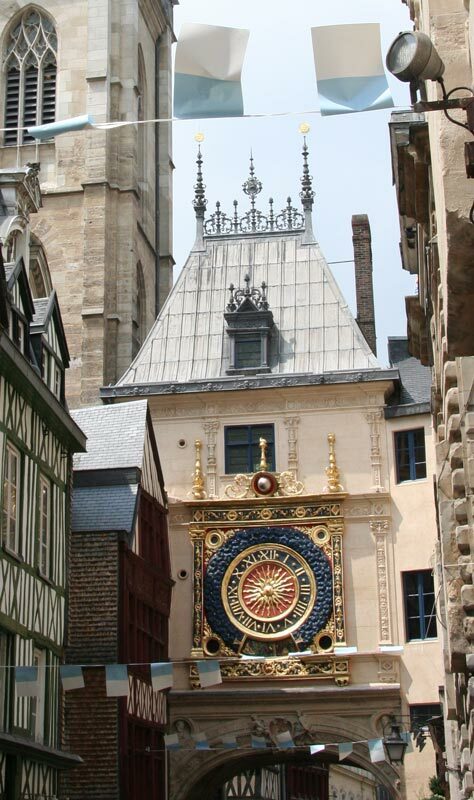 Instead we had time for a cycle ride round the centre of Rouen, stopping at the Gros Horloge and the Eglise de Jeanne d'Arc. 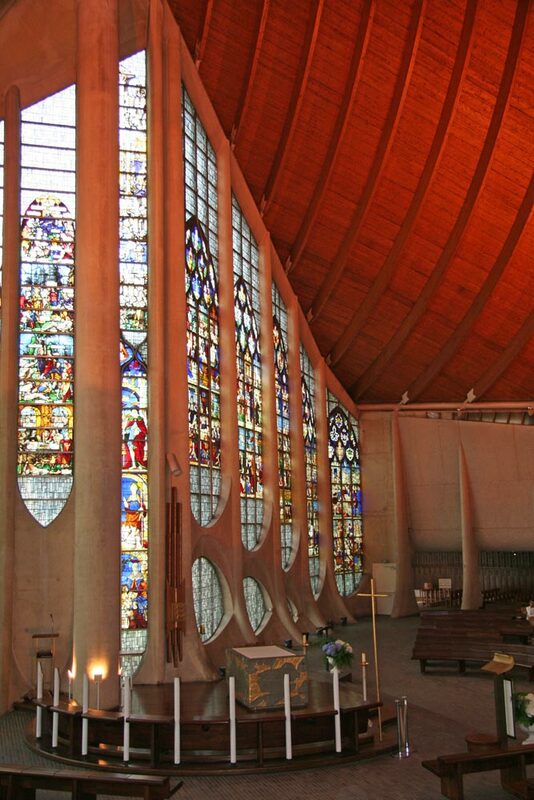 Built on the spot where the 19-year old Joan was burnt at the stake by the English, the church's curved timber roof gives it a nautical flavour, whilst the 16th century stained glass windows were recovered from another church destroyed in 1944. Next door in the Place du Vieux Marché the daily covered market is a good place to shop for fresh provisions.